What is it that I am looking at? A picture of a geological phenomenon from very up close? Oil pollution from a great distance? Data Mirage Tangram, the new album by The Young Gods has a fascinating cover, that much is for sure. The No Longer Young Gods is a good name as well. Being around since 1985 this is the band's eighth album, but first since 2010. The first result on record of the rejoining the band of original keyboard player Cesare Pizzi. 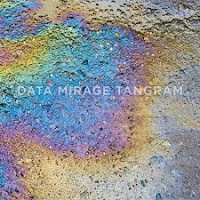 As intriguing as the artwork is, so intriguing and mysterious is the music on Data Mirage Tangram. This is my first album by the band, so there's no comparison possible for me. What I can imagine is that anyone listening superficially to this music may be turned off as so little may appear to be happening. Yes, the beat can be more pronounced but still not a lot happens when busy doing other things. O.k., I will allow 'Tear Up The Red Sky' here giving someone quite the jolt. A superficial introduction to this album certainly is misleading. The wealth of Data Mirage Tangram reveals itself when time spent alone with it. Over the drums of Bernard Trontin a host of electronics is laid, but also guitars can be heard here and there. Singer Franz Trechler never just sings. His vocals are always treated by something, making them sound robotlike, without hindering the songs in any way. 'Tear Up The Red Sky' is a strange amalgam. The vocal melody of the chorus makes me think immediately of U2's 'Bullet The Red Sky', one of the better songs of 'The Joshua Tree'. Where the vocal delivery brings Mark Lanegan to mind. That does not give The Young Gods all the right credits due though. In fact just concluding this would short sell the band tremendously. It is in the natural way the electronics mix with organic that the band's music really comes to life. I have come to the conclusion that this is the kind of album that needs to be played loud. That way the details come alive and the music takes over everything. Wikipedia mostly tells about who was influenced by the early The Young Gods and hardly says anything about the band itself nor its accomplishments. Anno domini 2019 the band has listened very well to what happened in the past 40 years. Phil Collins' first hit single 'In The Air Tonight' and some mid 80s Genesis can be heard here, some Bowie, some U2, the already mentioned Lanegan. It is when The Young Gods go out on a limb rhythmically, like in 'Moon Above' that things really get weird. What is this? Jazz? Free for all music? I simply can't tell. Something hard to listen to for sure. A whaling harmonica, almost more sorrowful than the one in 'Once Upon A Time In The West', makes the song sound like something so sad. While at the same time I keep wondering what is going in here. The basis of the song is almost as if created by AI or robots, with everything human cut out and a lone soul crying out for help through a harmonica. There are two sides to Data Mirage Tangram. The more experimental side, some extreme some less and the rock side. This dichotomy makes for very interesting listening. There's no way of knowing what happens next on Data Mirage Tangram. Musically approaches lie so far apart between the different songs. At the same time the album certainly does come alive, whatever the first impression might have been. It even explodes a few times, like in 'All My Skin Standing'. The guitar eruption is akin to 'In The Air Tonight''s drum one. The whole song is pregnant with an inner tension that is let loose, but far from solved afterwards. Layer after layer of guitars are stacked to find relief. All in vain it seems. The nervous tension permeating 'You Gave Me A Name' is kept up during the whole song. The synths keep pulsing and pulsing. Again nothing much seems to happen, yet touching it may have the same effect as touching live wire. The Young Gods are not your run of the mill band like Data Mirage Tangram, whatever that means, is not an average album. This album is special and large chunks of it are good as well. Something is going on all of the time, even if I do not know what it is nor always understand it. It simply means there's still so much left to discover.